European broadcasters are frightened at the prospect of seeing viewers and crucial mandatory TV license fees erode away as an invasion of American on-demand streaming from Netflix and Amazon takes its toll on traditional television. Netflix’s almost limitless budget for original local/in-country productions is threatening to outspend traditional European broadcasters and giving viewers a new reason to stop paying compulsory TV license fees, which do not apply to foreign-owned streaming services. Unlike in the United States, where non-commercial public broadcaster PBS receives most of its financial support from corporate underwriting and voluntary contributions from viewers and listeners, many European countries finance their national, over-the-air public broadcasting services with a mandatory annual license fee. In the United Kingdom, for example, a household must pay $200 a year if their home has color TV sets or $68 a year for black and white-only TV sets if they watch the BBC. These fees cover the costs of the BBC’s extensive commercial-free radio and TV service and keep it independent of the British government. 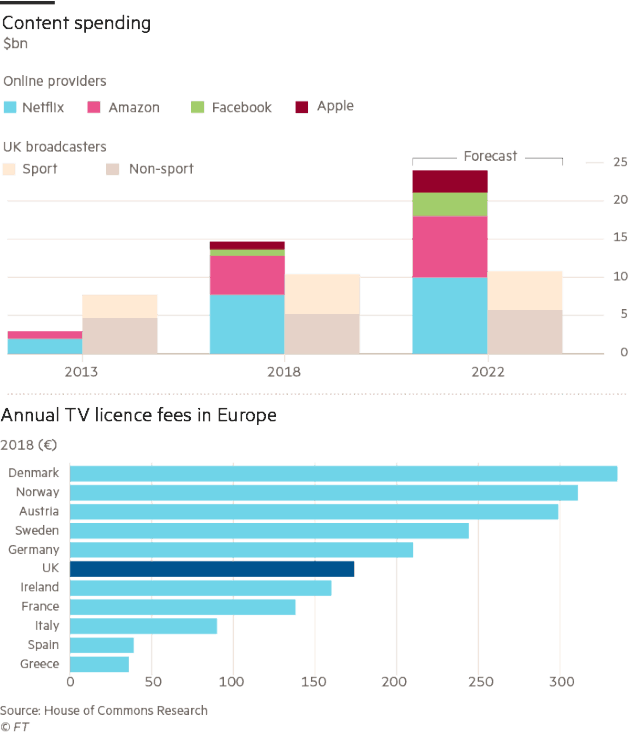 That fee is a bargain compared to Denmark, Norway, and Austria where TV license fees exceed $300 US annually. Enforcement officers using TV detector vans drive through neighborhoods looking for unlicensed TV homes by detecting signals emitting from a switched-on television. Warning letters and a visit from an enforcement officer quickly follow. But as streaming services take hold, it is becoming more difficult for licensing officers to determine if a resident is using their television to watch the BBC, which requires a license, or on-demand content from a streaming service like Netflix, which does not require a license. 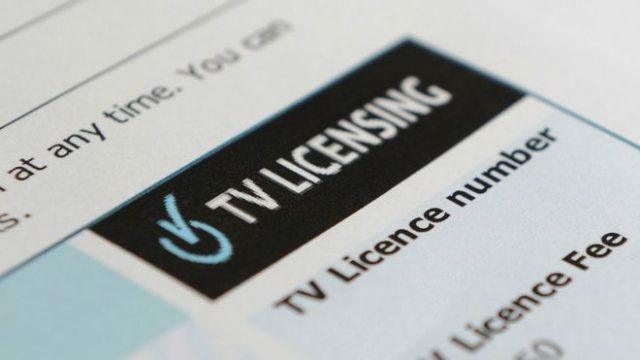 It’s a growing issue in the United Kingdom, where TV license cancellations are now rising for the first time in five years, particularly as younger viewers move away from traditional linear-live TV programming. According to the Financial Times, by 2022 Netflix, Amazon, Facebook and Apple could outspend traditional UK networks by a factor of four. Independent of the BBC, Britain’s commercial ITV network is also reporting increasing viewer defections, especially among younger audiences. Traditional pay television, usually delivered by Sky satellite or Virgin’s cable system, is also experiencing dish/cord-cutting as viewers start to abandon traditional TV packages. UK networks are planning to respond to the threat by building on their current streaming successes, particularly BritBox, a joint venture of BBC Studios and ITV targeting North American audiences with on-demand British television series and original productions. BritBox has attracted a loyal following in the U.S. and Canada willing to pay around $7 a month, effortlessly raising almost half of the amount of a traditional UK TV license from North Americans without the expenses of traditional broadcasting, staffing, and collections. In the UK, a TV license grants viewers automatic access to iPlayer from the BBC, which offers live streams and short-term access to on-demand programming. Both UK broadcasters believe a service like BritBox, offering a more extensive library of older programming and full seasons of TV shows may interest UK audiences more — perhaps enough to pay another $7 a month for access, in addition to their TV license fee. Other European broadcasters are dabbling in streaming ventures, but currently see less threat from the English-language dominant catalog of content from services like Netflix. In fact, many of those European broadcasters, particularly in Scandinavia, Germany, France, Switzerland, the Netherlands, and Belgium are earning extra revenue by licensing their native language content, subtitled for English language audiences, to streaming services like Netflix, MHz Choice, Hulu, and Amazon Prime.